Why Should You Teach Your Dog To Fetch – The Reasons Behind It! Are you asking yourself, why should you teach your dog to fetch? While many dogs are happy to chase a stick or ball, not all dogs are natural retrievers. Some won’t chase a ball at all. Whilst others will chase but lose interest once the ball stops moving. 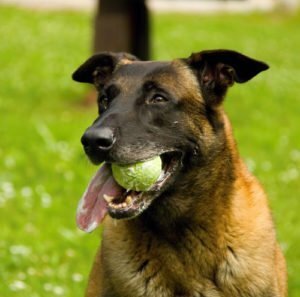 Some dogs love to pick up and carry the ball but have no interest in sharing it with their owners. A polished retrieve, where the dog runs after his ball and delivers stylishly right into your hand, is a pleasure both to watch and to teach. But the usefulness of the retrieve goes much further. Many dogs are bored. Really, really bored. And bored dogs get into mischief. Bored dogs chew more, they whine more, they seek attention more. Bored dogs are less happy and more annoying than dogs that are mentally stimulated. Your dog will enjoy retrieving once you’ve shown him how and he may even enjoy the lessons—each and every one. Life will be less boring! Many dog owners struggle with control issues. Especially in the countryside, and especially with hunting breeds such as hounds and gun dogs. Control issues arise outdoors in the countryside when dogs are being exercised. But dogs need exercise on a regular basis which causes a dilemma for those in difficulties with a lively and independent dog. Training a good recall is one part of the solution. But managing the dog’s free time rather than letting him entertain himself is equally important. And that is where fetch comes in. Fetch occupies your dog in a controlled and constructive way outdoors. And it puts you slap bang in the middle of the game. Your dog can chase butterflies without you. He can eat rubbish without you, splash in streams without you, and bark at squirrels without you. But your dog cannot play fetch without you. Your control over your dog diminishes with distance and keeping your dog relatively close to you is crucial. Country walks are intrinsically interesting to many dogs and there are many distractions competing for your dog’s attention. Unless you are more attractive than your dog’s surroundings, you are going to have a tough time keeping him close to you. Getting a dog fascinated with retrieving is a great way to keep him involved with you, and to get back in control because he needs your participation in order to enjoy this game. Many dogs have varying degrees of natural retrieving instinct, and it is often possible, especially with natural retrievers, to mold a good enough retrieve using a variety of gundog training strategies. However, these do take a certain amount of skill and practice. So the best option for most novice dog owners is usually to teach a retrieve in stages—starting at the end with the hold and delivery. This may seem a backward way around but it is the most consistent and reliable way of getting a dog to fetch something and actually place it in the palm of your hand. It has the advantage of being a completely standard system that can be worked through by anyone, with any breed of dog. It requires no special skill or training. You’ll need some equipment to teach a trained retrieve. There are no hard and fast rules, but ideally, the item will be something you can easily grasp. You’ll need an event marker, a clicker is best for this job, some high value treats for each training session, and a quiet restricted area to train in. Once you have taught the basic method, you can apply it to other items such as frisbees or balls. A dumbbell has the advantage that the dog has to hold it in the middle and can’t easily pick it up by one end. Obviously, the size needs to suit your dog. Any healthy dog can be taught to retrieve, large or small. He doesn’t need to be a retrieving breed, he doesn’t need to like chasing a ball, he doesn’t need any previous experience. He just needs you to help him with dog training. In this article, we looked at why you should teach your dog to retrieve and the equipment you’ll need to get started. Check out the next retrieve article. We take a look at how to teach fetch to any dog in just a few easy steps. Join us again soon, and don’t forget to join our email updates list so that you don’t miss out on any of our articles.